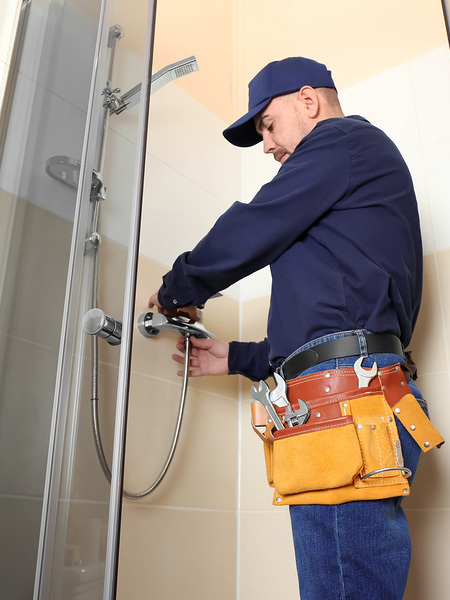 Why not let an experienced handyman handle the shower repair for you? Leaks, difficulties setting and maintaining the right temperature, or inconsistent water stream can turn the simple habit of taking a bath into an incredibly annoying event. Most shower faults can start as a minor inconvenience, but ignore them can become a serious issue. Don’t hesitate to contact Handyman Near Me if there is a plumbing problem in your home. Be it an emergency or a scheduled booking; our skilled team will diagnose and fix the shower fault. Get fast and high-quality plumbing services by booking the best handymen in London! Although they look like the electric ones, power showers need both hot and cold water supply, and they have a pump, instead of a heater. The pump increases the water pressure making this shower a good choice in areas with inconsistent pressure. Usually, faults with power showers are related to the pump or happen due to trapped air. Handyman Near Me in London diagnoses and repairs power showers, we can also help you install a new body, or replace the old. These fixtures are popular because they allow setting and maintaining a constant temperature of the water. The most common faults with these fixtures are leaks and fluctuations in temperature. These showers have both mechanical elements like the valve and on electronics ones – a built-in thermostat that helps regulate water temperature. Our skilled handypersons start thermostatic shower repairment with accurate diagnostics to find and fix the fault in the best possible way. This classic bathroom fixture mixes hot and cold water after manual adjustment of the temperature. The most common faults with mixer showers are a direct result of limescale build-up. The issues can be leaks and drip from the shower head or body, and troublesome work of the taps/controls. Mixer shower repair is a simple task for our skilled professionals, and it won’t take long before the problem is gone.